About: This plugin is required for some of the plugins made by Grum. About: EStat (Extended Stat) that generates statistics with more details than statistics included in Piwigo by default with advanced filters, sort and export (CSV, ODS, SQLite) functionnalies on data. 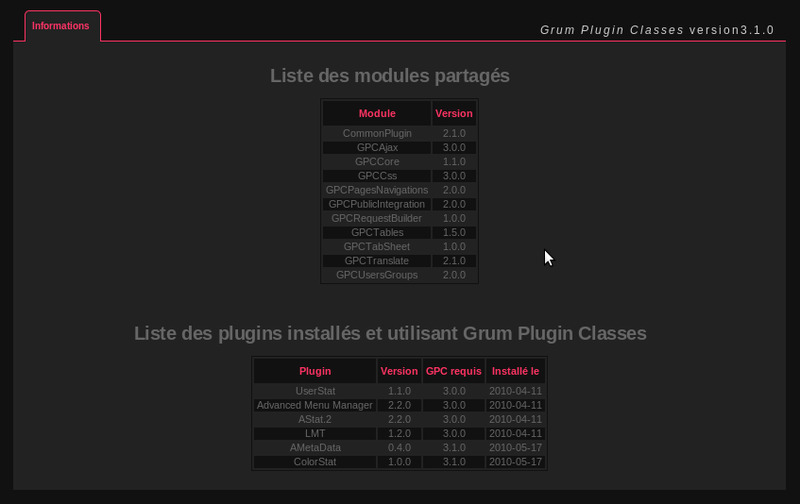 To work, the plugin requires the 'GrumPluginClasses 3.5.4' plugin was previously installed. Changes: Warning: this is a BETA release for tests only. So, please use it on test gallery only. Some bugs are known and fixed yet (exporting big historics) and some functionnalities are not implemented (tunning, statistics). IN THE NEXT UPDATE, STATISTICS MADES BY THIS PLUGIN WON'T BE KEPT (this is a choice, to prevent people using this plugin outside a test gallery).